I finally finished a baby quilt for my son’s 1st/2nd grade teacher. The baby was born over a month ago, but that’s the way sewing goes around here. Since work ended in late May and school ended in mid-June, I’ve had a little more time to squeeze in some sewing. 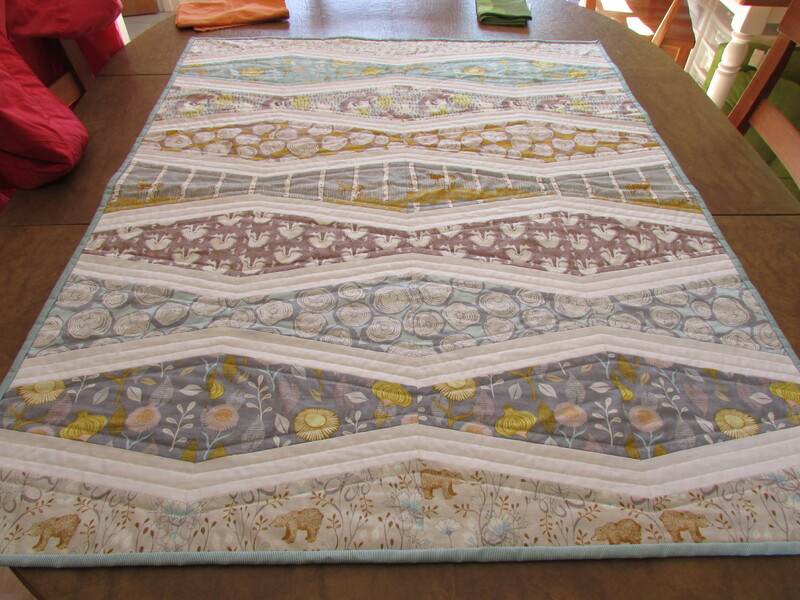 The pattern is Elizabeth Hartman‘s New Wave Quilt. 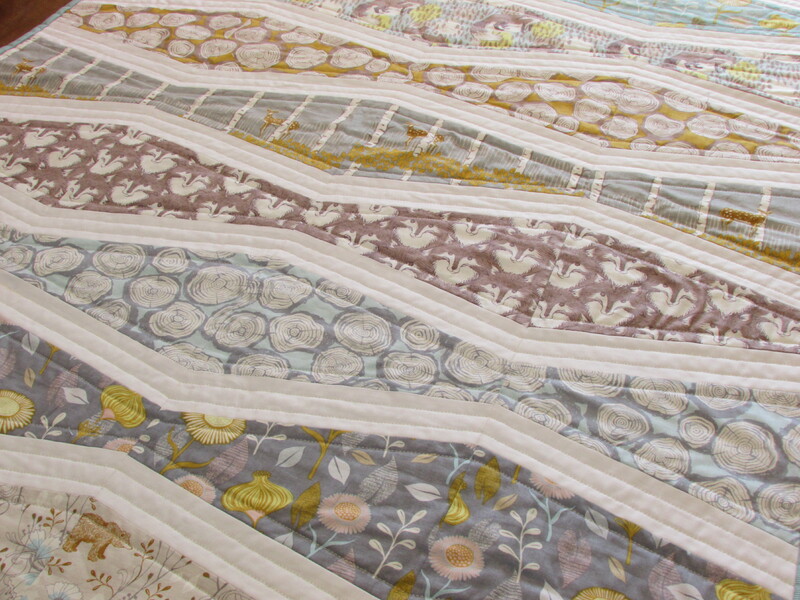 The fabrics are from Sarah Watt’s Timber & Leaf collection for Blend Fabrics. I fell in love with this collection and knew it would be perfect for this family. Even though there’s a lot of fox fabric out there, I think this collection has the cutest one! For the stripes in between the prints, I used Kona Snow and for the binding I used the tiny stripe in aqua from Locally Grown by Marisa and Creative Thursday for Andover Fabrics. Here’s a picture of the back of the quilt. I was hoping to use one solid piece of the fawn fabric and not do a pieced back, but I found a flaw in the fabric and needed to cut it off. Unfortunately, this print is hard to find and I could not find enough yardage at a reasonable price. So, I added a few other prints along the side. I just made a simple embroidered label for the back. I have been wanting to practice embroidery and hope to bring some along to keep my hands busy on our road trip later this summer. Here’s a full view of the quilt. Due to my fear of free motion quilting on a gift project intended for someone else and not just for me, I chose to just do some straight quilting along the waves. I think it turned out pretty well. But I would like to be a little more experimental on some upcoming projects. Several months ago I was able to get out on a crafty outing by going to see Susan Beal do a book signing at Powell’s for her most recent book, Modern Log Cabin Quilting. I was star-struck by seeing some of the well-known Portland bloggers that were there for the event. I am such a geek. 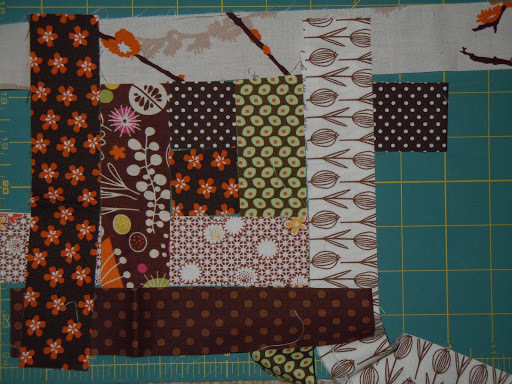 I used the blue log cabin squares to make a little zippered pouch project that is included in Susan’s book. I’ll get some pictures up of that when I can. I haven’t been posting much, but finally have the time to get a little done as my little guy is engrossed in the final episodes of the Clone Wars. I’ve going through all my pictures and trying to share some of the things I’ve actually completed this spring. Here’s the Story Quilt I had been working on for some time. I finally finished in March. 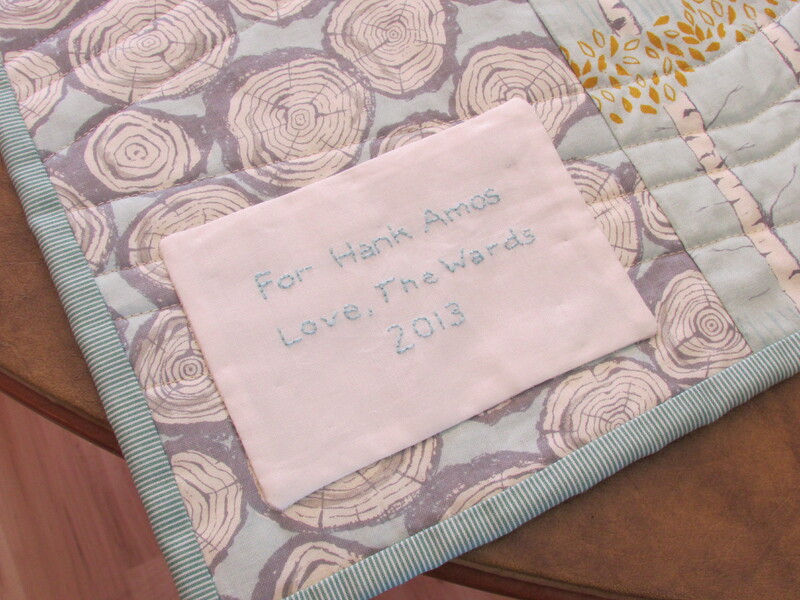 The Short Story quilt is moving along ever so slowly. It’s actually at my sewing machine right now about halfway quilted. But I don’t have any pictures of the process. It is coming out ok, but there have been a few bobbles — like forgetting to leave the needle down when I pivot or forgetting to put the presser foot back down. So that leaves a few weird stitches. Also, when the quilt sandwich is not moving freely and gets caught on the edge of the sewing table, the stitches get tight. But after leaving it be for a while, I don’t notice these things as much when I come back to it. 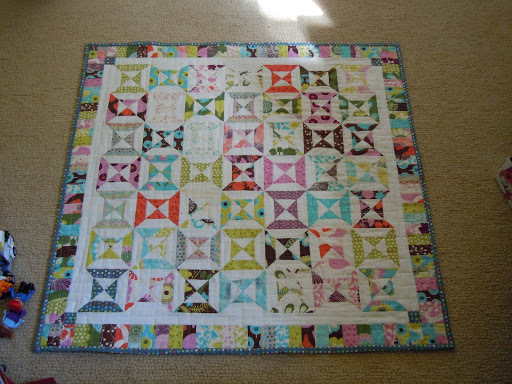 Here’s some pictures of the quilt top before I started quilting. 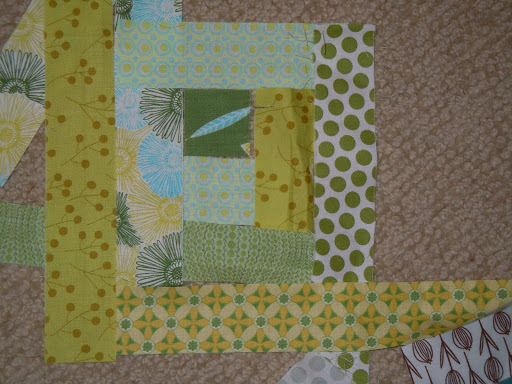 Here’s the blocks all sewn together. Here’s the border and the corners added on. Here’s the lovely Enzo enjoying the quilt sandwich process. The 49 squares for my next quilt are all made. I’m using two charm packs of Liz Scott’s Sugar Pop! and Kona Cotton in Snow. 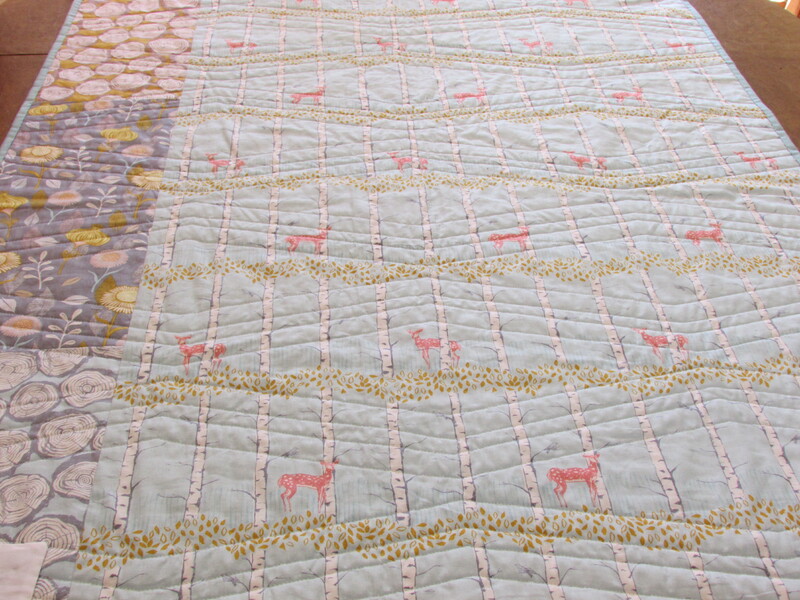 The pattern for this quilt is called Short Story and it is from Carrie Nelson’s Schnibbles Times Two: Quilts from 5″ or 10″ Squares. This is only my 2nd official quilt and the first one I did contained no solids. I liked the way it turned out, but it was very busy and there was nowhere to rest your eyes. So, using solids to offset my love of color is a new approach. 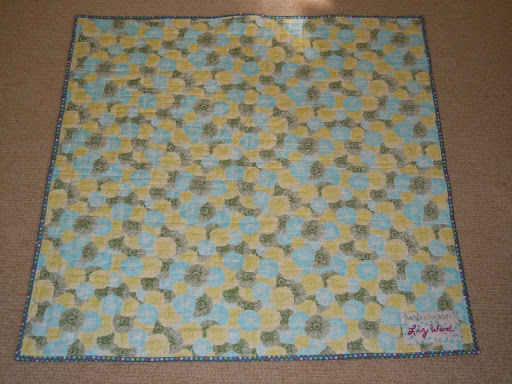 I’ll get more pictures up once I sew the squares together and start adding the sashing and border. 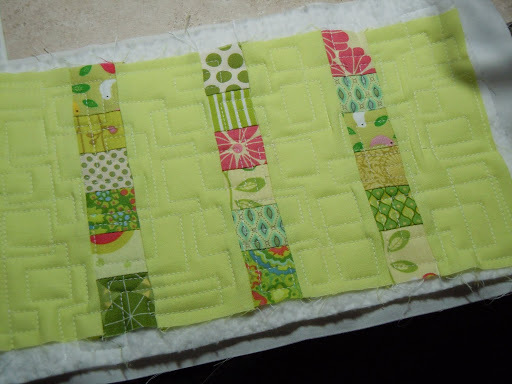 Trying some machine quilting on my own after a class with Elizabeth Hartman a while back. 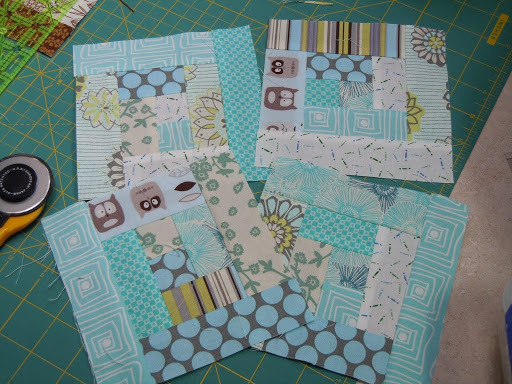 Here I pieced together some of the many 1 1/2″ squares I’ve cut from scraps and used some spearmint green Kona cotton between the patchwork strips. I made four of these rectangles. They are an odd size. 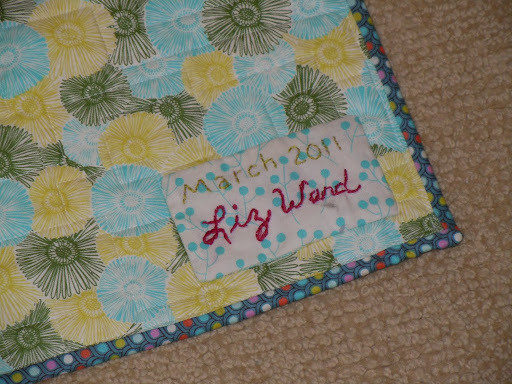 Then quilted them using my favorite design so far — what I call the “mod square”. Not sure what I’m going to do with them. Maybe a pillow or a table runner? I’ve moved on to some other things, but will revisit these soon.